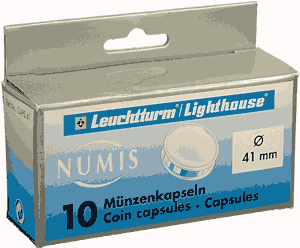 Package of 10 Model Size Color Pack Qty CAPS14 14mm 10 Direct fit, clear, round coin capsules for U.S. and foreign coins. Sold in packs of 10 by mm size. 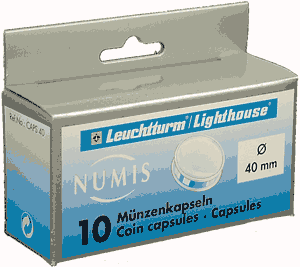 Package of 10 Model Size Color Pack Qty CAPS16 16mm 10 Direct fit, clear, round coin capsules for U.S. and foreign coins. Sold in packs of 10 by mm size. 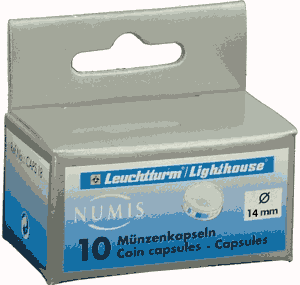 Package of 10 Model Size Color Pack Qty CAPS16.5 16.5mm 10 Direct fit, clear, round coin capsules for U.S. and foreign coins. Sold in packs of 10 by mm size. Package of 10 Model Size Color Pack Qty CAPS17 17mm - 1/10 Gold Eagle, $5 Gold 10 Direct fit, clear, round coin capsules for U.S. and foreign coins. Sold in packs of 10 by mm size. 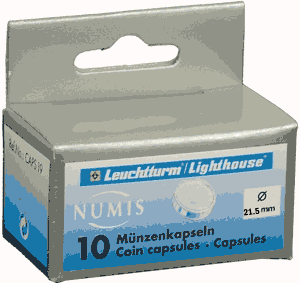 Package of 10 Model Size Color Pack Qty CAPS18 18mm - Dime 10 Direct fit, clear, round coin capsules for U.S. and foreign coins. Sold in packs of 10 by mm size. Package of 10 Model Size Color Pack Qty CAPS19 19mm - Cent 10 Direct fit, clear, round coin capsules for U.S. and foreign coins. Sold in packs of 10 by mm size. Package of 10 Model Size Color Pack Qty CAPS19.5 19.5mm 10 Direct fit, clear, round coin capsules for U.S. and foreign coins. Sold in packs of 10 by mm size. 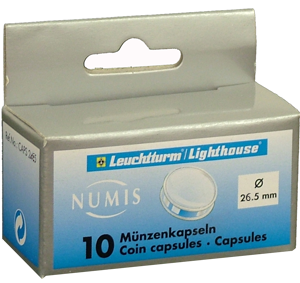 Package of 10 Model Size Color Pack Qty CAPS20 20mm 10 Direct fit, clear, round coin capsules for U.S. and foreign coins. Sold in packs of 10 by mm size. 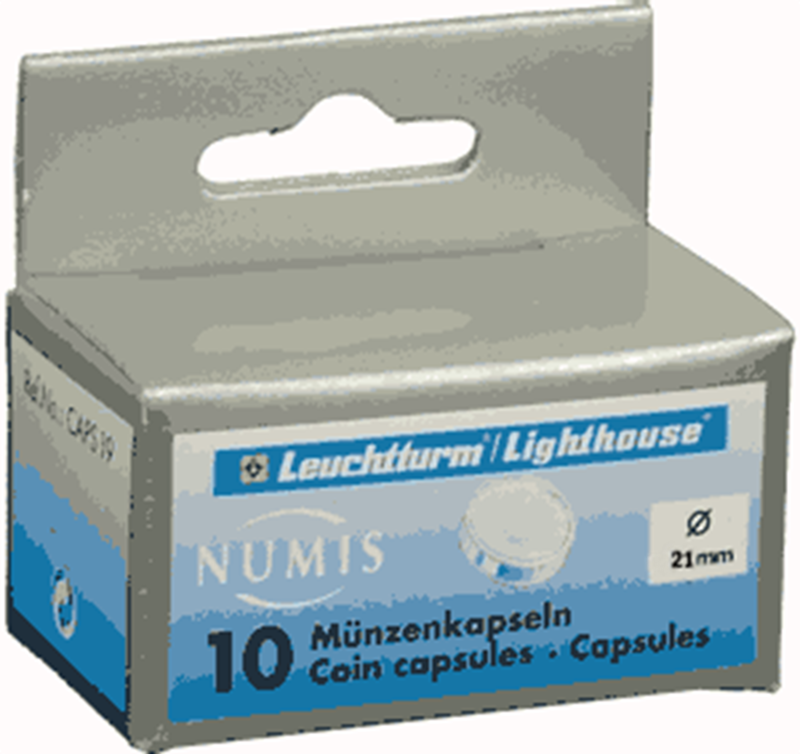 21mm - Coin Capsules (pack of 10) Model Size Color Pack Qty CAPS21 21mm 10 Nickel sized direct fit, clear, round coin capsules. Package of 10 Model Size Color Pack Qty CAPS21.5 21.5mm - Nickel 10 Direct fit, clear, round coin capsules for U.S. and foreign coins. Sold in packs of 10 by mm size. Package of 10 Model Size Color Pack Qty CAPS22 22mm -1/4 Gold Eagle, 10 Direct fit, clear, round coin capsules for U.S. and foreign coins. Sold in packs of 10 by mm size. Package of 10 Model Size Color Pack Qty CAPS22.5 22.5mm 10 Direct fit, clear, round coin capsules for U.S. and foreign coins. Sold in packs of 10 by mm size. Package of 10 Model Size Color Pack Qty CAPS23 23mm 10 Direct fit, clear, round coin capsules for U.S. and foreign coins. Sold in packs of 10 by mm size. Package of 10 Model Size Color Pack Qty CAPS24 24.3mm 10 Direct fit, clear, round coin capsules for U.S. and foreign coins. Sold in packs of 10 by mm size. 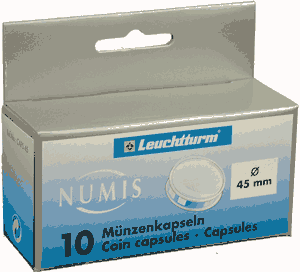 Package of 10 Model Size Color Pack Qty CAPS24.5 24.5mm - Quarter 10 Direct fit, clear, round coin capsules for U.S. and foreign coins. Sold in packs of 10 by mm size. 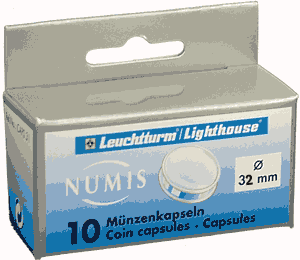 Package of 10 Model Size Color Pack Qty CAPS25 25mm 10 Direct fit, clear, round coin capsules for U.S. and foreign coins. Sold in packs of 10 by mm size. 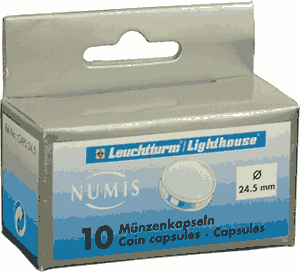 Package of 10 Lighthouse coin capsules to fit 27mm coins. Model Size Color Pack Qty CAPS27 27mm - SBA/SAC, 1/2 Gold Eagle 10 Direct fit, clear, round coin capsules for U.S. and foreign coins. Sold in packs of 10. This item holds 27mm coins. Package of 10 Model Size Color Pack Qty CAPS28 28mm 10 Direct fit, clear, round coin capsules for U.S. and foreign coins. Sold in packs of 10 by mm size. Package of 10 Model Size Color Pack Qty CAPS29 29mm 10 Direct fit, clear, round coin capsules for U.S. and foreign coins. Sold in packs of 10 by mm size. 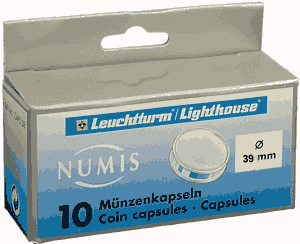 Package of 10 Model Size Color Pack Qty CAPS30 30mm 10 Direct fit, clear, round coin capsules for U.S. and foreign coins. Sold in packs of 10 by mm size. Package of 10 Model Size Color Pack Qty CAPS31 31mm - Half Dollar 10 Direct fit, clear, round coin capsules for U.S. and foreign coins. Sold in packs of 10 by mm size. Package of 10 Model Size Color Pack Qty CAPS32 32mm 10 Direct fit, clear, round coin capsules for U.S. and foreign coins. Sold in packs of 10 by mm size.